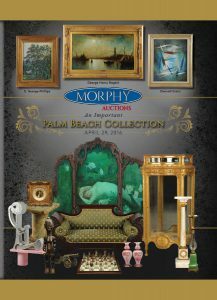 Morphy Auctions holds 2 Fine & Decorative Arts auctions per year. Our Fine & Decorative Arts division encompasses collections of all varieties. Within this division, are many sub-categories in which we specialize. 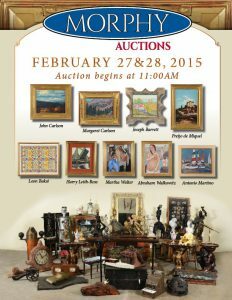 Looking to consign pieces for our Fine & Decorative Arts Division? Contact Mike Fredericks, head of the division. 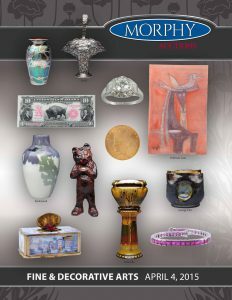 Mike Fredericks joins the Morphy Auctions team from James D. Julia and is our Department Head for the Fine and Decorative Arts Division. Mike is a 13-year veteran with the company, most recently as Julia’s Department Head for the Rare Lamps, Glass and Jewelry division, specializing in 20th century lighting and art glass of the Victorian, Art Nouveau and Art Deco periods. Prior to this position, he was the Operations Manager and Staff Supervisor of James D. Julia, overseeing logistics and production workflow for the organization. Mike previously worked in the commercial printing industry, having been an Account Executive and Manager for a leading New England company with a niche in the auction catalog market. His love of history, photography, experience with production management, and fascination with the auction process made for a natural transition to our industry. Mike has been a licensed auctioneer since 2011. A U.S. Army Veteran, Mike graduated from various Professional Development and Leadership schools during his five years of service as a Non-Commissioned Officer, and proudly served during the Gulf War of 1990/1991. Following his military commitment, Mike earned certifications from the Maine Criminal Justice Academy, serving both as a Sheriff’s Deputy and Corrections Supervisor. Tony Greist graduated from Tufts University in 1971 with a Bachelor of Arts in Psychology & French, with a certification in teaching. He then received his Master’s Degree of Education in Clinical Counseling in 1972. He then worked as a Mental Health Therapist from 1972-1973, at which point he decided to pursue his hobby of buying and selling antiques and the restoration of furniture. This quickly became a full time adventure, resulting in sole proprietorship of his company from 1973-2001. The business evolved from roots in the Oak & Victorian American furniture market through early American antiques, and later the inclusion of English and European antiques. Early on, Tony learned that to be successful at wholesale and retail levels, the auction market would be an important element. This resulted in his attending auctions on a daily basis for the first 10 years of the business. In the 1980s, he fostered relationships with English and European antiques dealers, resulting in an extensive wholesale operation involving both the import and export of many of the antiques he was handling. This included ventures in England, Western Europe and Scandinavia. By 1984, Tony took on a partner and together they built and opened a 23,000 sq. foot, state of the art facility in Southern New Hampshire. 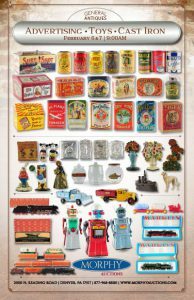 This quickly became one of the largest wholesale retail antique centers in operation at the time. 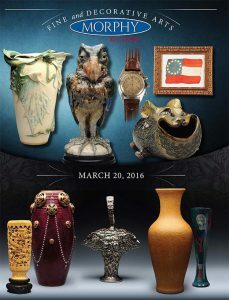 By the mid-1990s, Tony had sold this business and relocated to Atlanta, Georgia, where he opened a wholesale antiques warehouse from which he continued to operate as a base while purchasing antiques throughout the Southeastern United States. During this period, literally thousands of miles of travel were necessary to discover and obtain the high quality antiques that the market demanded. In 2000, Tony had accepted a position with a prominent auction house in New England where he continued to work until 2007. At this time, Tony re-established his contacts at James D. Julia, Inc.
Tony now works alongside Mike Fredericks in the Fine Art, Asian & Antiques division. Tony focuses on filling the auctions of the division using his extensive knowledge and experience with furniture and furnishings from the 18th & 19th centuries. Dr. John Morphy, a retired physician, was part of the Morphy team long before “the team” ever existed. 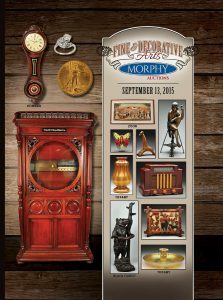 As the father of Dan Morphy Auctions’ CEO, Dan Morphy, Dr. Morphy was the guiding force who sparked and nurtured Dan’s interest in the antiques industry. With his knowledge and appreciation of antiques, “Doc,” as he is known to one and all, was Dan’s most important influence and a constant source of encouragement to his son as he ventured into antiques as a profession.Dr. 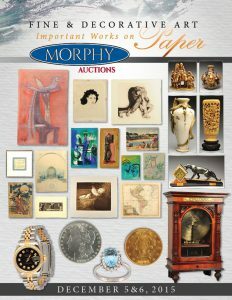 Morphy’s primary duties are to provide catalog descriptions and condition reports, appraise goods and assist with the shipping of items purchased at auction. His expertise developed over 35+ years in the industry and includes, but is not limited to, art glass, fine art, antique toys, country store, holiday and general antiques. 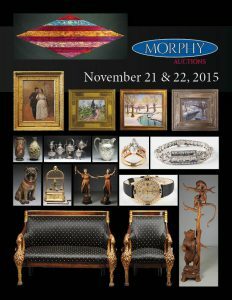 He also represents Dan Morphy Auctions at many shows across the country. Dr. Morphy is an integral part of the day-to-day operations at the gallery, and in his free time he is still buys, sells and collects the antiques he has grown to love. Peter joined Morphy auctions in 2008 as a consultant cataloguing antique and modern silver, and now heads the silver division. For over fifteen years he acted as a collector’s agent and advisor, buying antique silver in London and South- Eastern England for several private collectors, and he continues to keep in contact with the London silver trade. Peter began as a spoon collector in his late teens, with a special interest in silver hallmarks. He has a BA in History and Art History from William & Mary,a Diploma from the Royal Society of Arts in London from the Christies Fine Arts Course, and is a member of the Silver Society (London). He continues to advise private clients on acquisitions of English and American silver, as well as preparing appraisals and inventories.